Here’s a new idea for plastic canvas – fashion accessories for your hair! This stylish set offers four pretty pieces’ to top off your wardrobe, what a clever idea! 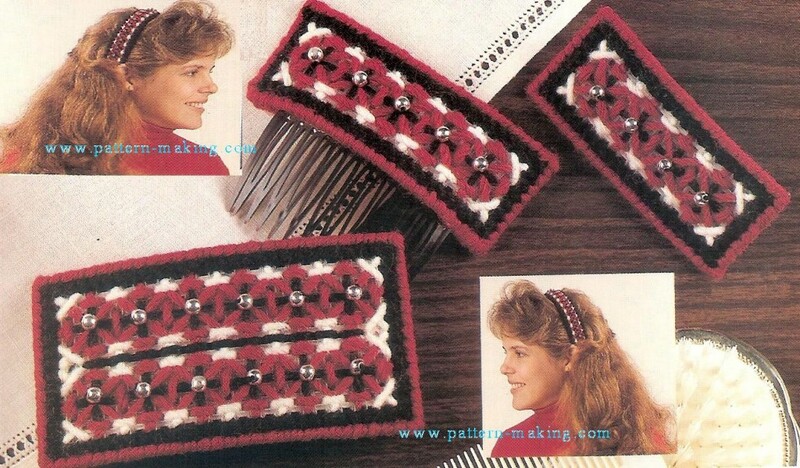 Headband Size: 1-1/4″w Large Barrette Size: 4-1/2″ w x 2-3/8″ h Small Barrette Size: 3-1/4 “w x 1-3/8 ” h Comb Size: 3-7/8″ w x 1-1/2″ h Supplies: Worsted weight yarn (refer to color key) one 10-1/2″ x 13-1/2″ sheet of 7 mesh plastic canvas, #16 tapestry needle, 43 – 4mm silver beads, 3/4 “w plastic headband, 3-1/2 “w hair comb, 3″ I and 4” I barrette fasteners, clear-drying craft glue, felt, sewing needle, and thread Stitches Used: Backstitch, Cross Stitch, Gobelin Stitch, and Overcast Stitch Instructions: Follow charts and use required stitches to work piece. Use sewing needle and thread to attach one silver bead to piece at each x For Headband only: For Bottom, cut a piece of plastic canvas 85 x 8 threads. (Note: Bottom is not worked.) Use black to join Top to Bottom along short edges. Place plastic headband between Top and Bottom. Use black to join Top to Bottom along unworked edges, easing pieces to form headband shape . For Barrettes only: Cut felt slightly smaller than barrette and glue to wrong side of stitched piece. 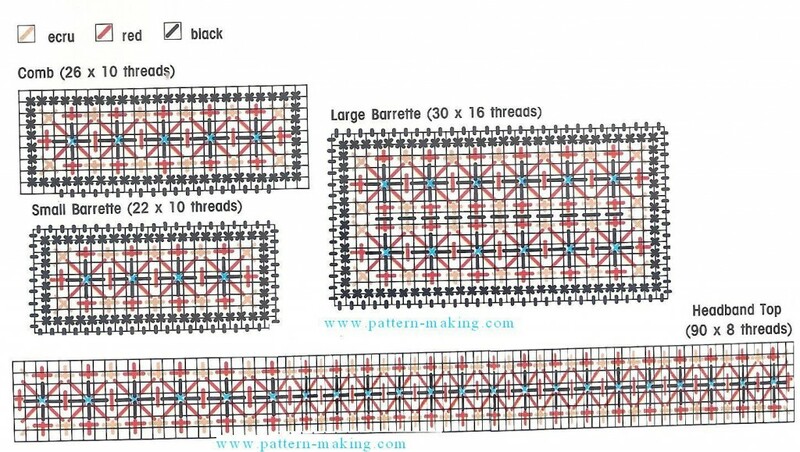 Glue barrette fastener to center of felt. For Comb only: For Back cut a piece of plastic canvas 24 x 10 threads. Work Back with red Tent Stitches. 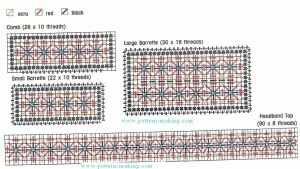 With wrong sides together, use red to join Front to Back along unworked edges of Front. Insert comb into opening and glue opening closed .Designed by Celia Lange.